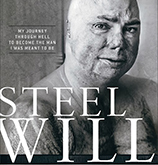 Shilo Harris | Inspirational Speaker | Author of Steel Will – Shilo Harris is an inspirational speaker who shares his unforgettable story of triumph over adversity. Shilo Harris is an inspirational speaker who shares his unforgettable story of triumph over adversity. Shilo is available to speak with audiences around the country on a wide variety of topics. His message is one of hope, resiliency, and triumph over tragedy, and has already enriched audiences in the public and private sector. He can tailor his message to meet your needs. On February 19, 2007, SSG Shilo Harris was patrolling an infamous southern Iraqi roadway when his Humvee was struck by an IED. Moments later, three members of his crew were dead and Shilo had sustained severe injuries that would alter the course of his life. My goal is to assist warrior veterans and their families in locating the resources they need for recovery. These partners represent the kindness, generosity, and ingenuity of many thousands of Americans who support our veterans. Help is out there. We are living proof. The term "Hero" gets thrown around a lot these days, and often people are put into situations where they perform heroic acts, but shy away from being branded a hero. Shilo Harris is truly an American Patriot and Hero. He epitomizes what it means to be a Soldier, who serves selflessly and is focused on taking care of his fellow Soldiers. 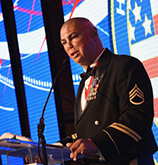 I first met Shilo approximately 5 years ago where he was the keynote speaker at a major Department of Defense (Pharmacy) annual meeting with over 1,000 personnel in attendance from the Army, Navy, Air Force and Coast Guard. Shilo's story and journey is one of courage and resilience. His story of being gravely wounded in Iraq is worth hearing and the inspiration he provides is truly remarkable. Shilo's faith is strong, and he is proud to share (but not impose) his beliefs with any audience. I have never been left so emotionally uplifted and inspired as I have in listening to, and learning from the American Hero, Staff Sergeant Shilo Harris, U.S. Army. I am proud to call him my friend and Army colleague. Shilo has a special place in my heart. Though I cannot speak for all those who have had the good fortune of being in his presence as he so generously and openly shares his story, I know of many that he has touched, and touched for life. There is so much I could say about Shilo & his ability to connect with people, but what I find myself saying most often (when I feel like being brief) is this: It’s one thing to have a compelling story – it’s quite another to be a compelling storyteller. Shilo is a gifted storyteller who quite simply resonates with people. I say this having been a public speaker for over a dozen years, with a high standard when it comes to offering praise to those who grab a microphone & address others. — August Hernandez, Au.D., Territory Manager, Government Services West, Siemens Hearing Instruments, Inc.
We at Jiffy Lube International had Shilo along as our guest of honor and speaker at our annual convention, which was held in San Diego. I have had the privilege of hearing Shilo speak on a number of occasions and when we were scouting a venue for our convention party and were looking at securing the USS Midway, I just knew we had to have Shilo talk to our franchisees. The organizing committee was skeptical since this was traditionally a party evening and we had never had a guest speaker. I just told them to trust me on this! Shilo was awesome, he kept a crowd of 700 people in the cavernous air craft carrier hanger hanging on to ever word. Firstly, his story is an amazing one, but even more importantly, he tells it with humility, sharing his faith and his dreams. He makes the audience role with laughter, brings tears to everyone’s eyes, is a huge advocate for Veterans and really makes you feel proud to be an American! People lined up all night for an opportunity to talk to Shilo, to thank him and to pose for photo’s. Many of our franchisees have subsequently brought in Shilo as a motivational speaker for their employees around the country. I cannot say enough good things about the fine man that Shilo is. I can assure you that you will be so glad you heard Shilo speak and so will everyone else you give that opportunity to! 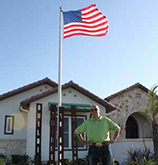 — Barry Wood, Director of Development Jiffy Lube International, Inc.
Shilo Harris is an American hero. A man who enlisted after 9-11 to do his duty, and who has endured immense personal and physical pain as a result. Shilo is an amazing public speaker. I have had the honor of seeing him speak on four occasions, and I have cried every time. Shilo blends gentle humor and self-deprecating jokes with the harrowing tale of his wounding and subsequent treatments that allows the audience to feel his inner emotions. It grabs you deep inside and does not let go. By the end, Shilo is endeared in your heart, and your faith in country is bolstered. I would recommend Shilo Harris as a guest speaker anywhere people want to make a difference. He is a gift. Shilo Harris is a gifted, endearing man who is an absolute pleasure to work with. I expected him to present a unique and brave story that spoke to our audience. What I got was a man drawing from a deeper calling and awareness. He is a force that is meant to be heard and he tells his story with love and humor and compassion. He went so far beyond my expectations and truly moved all of our audience, not just those who could identify with him as a veteran or as someone who has experienced tremendous pain. The gratitude I feel for having seen him work is immeasurable.